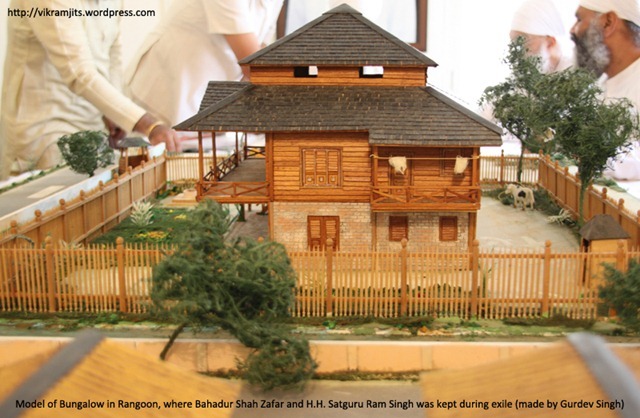 In 2005, I was sitting in my room when my dad called me and said, “Vikram, i have made the 3D model of Zafar’s last house”. I jumped with joy and rushed to his office, which is not too far from house. While I was walking towards his office, the entire scene of how my dad was working towards this from several months ran through my mind. 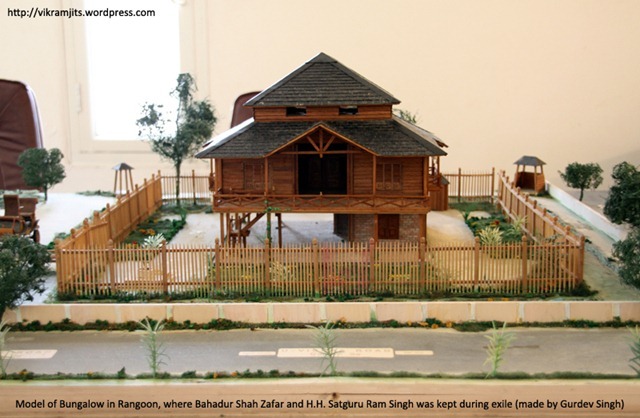 And finally he succeeded in recreating the bungalow, where the last Mughal emperor was kept and where he died. This building mean a lot to historians, writers, archaeologists and people with several other interests that help them relate themselves to this place. 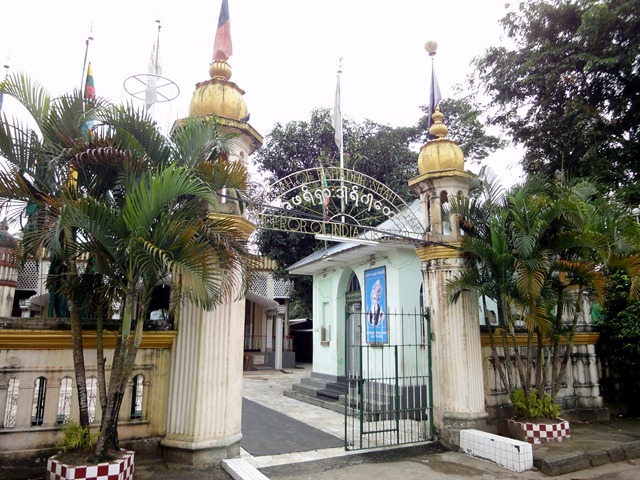 But for our family, it was important because one British officer wrote to the Queen that ‘Ram Singh’, the state prisoner from Punjab, who is arrested after his non-cooperation Kuka Movement is taken to exile and will be kept in the same building in Rangoon, where Bahadur Shah Zafar was kept in his last days. 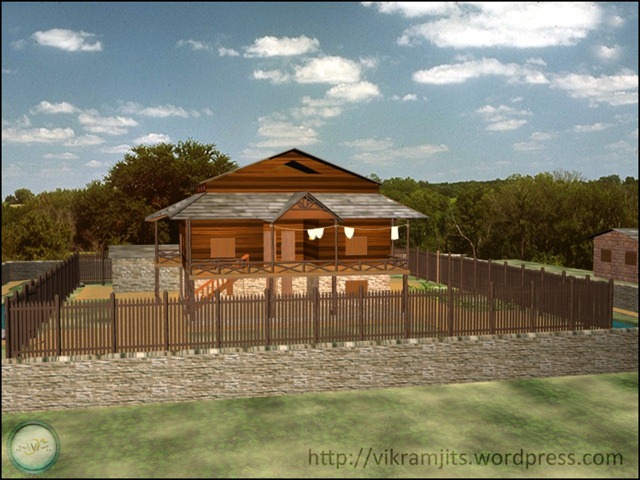 My father was working on a project related to Kuka Movement and this bungalow was very important for the completion of his work. Being a Namdhari (Kuka) family, this place is a shrine for us. Hence, the exploration began. 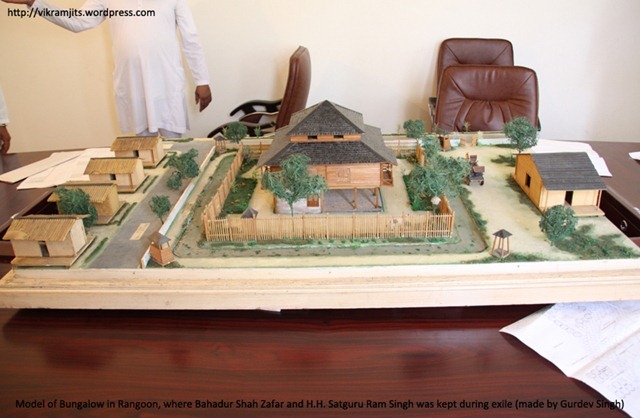 After my father learned the details of our religious master, Satguru Ram Singh Ji’s exile, he started reading document and books about Bahadur Shah Zafar. He spent 3-4 months in National Archives and read almost every letter that he thought could give a hint about Zafar and his stay at Rangoon. He found letters written by Captain H. Nelson Davies describing about Zafar, his family and health. Capt. Davies was supposed to give regular updates to the Queen regarding the deposed Emperor of Hindoostan. In one letter, he described the place where the former emperor under trial was kept. 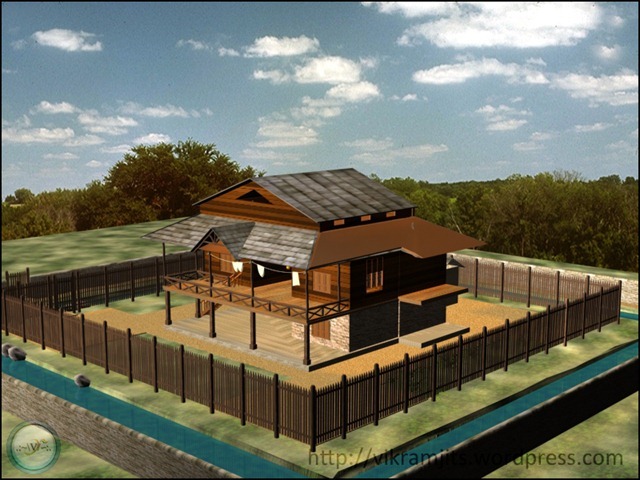 The house is situated within a few yards of the Main Guard and like wooden houses of the country is considerably raised off the ground. It is in an enclosure 100 ft. square and is surrounded by palisading 10 ft. high. 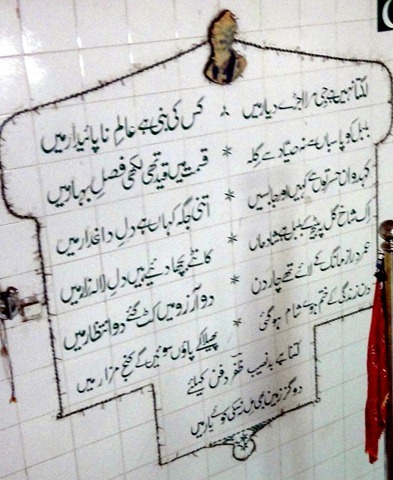 The accommodation consists of 4 rooms each, each 16 ft. square, one of which is allowed for the ex-king, another is occupied by Jawan Bakht and his young Begum, a third is appropriated by Zinat Mahal Begum; to each of these rooms a bathing is attached, Shah Abbas and his mother occupying the remaining rooms . 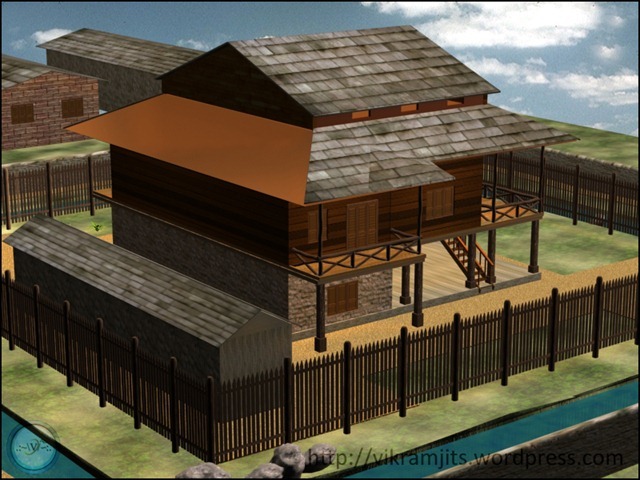 The attendants either lounge about the verandahs or put up underneath the house, which is covered by pounded brick to keep the place dry. A drain all around the house also contributes to his object. There are two bathrooms and a double necessary for the use of the servants, also a place to cook in. The venradahs in the upper storeys of the house are surrounded with chicks battened down. Here the old and enfeebled ex-K ing and his sons generally sit, and as the floor of the upper storey is raised nearly to the level of the pallisading, they enjoy the benefit of the prevailing sea breeze, and also an extended and cheerful view. 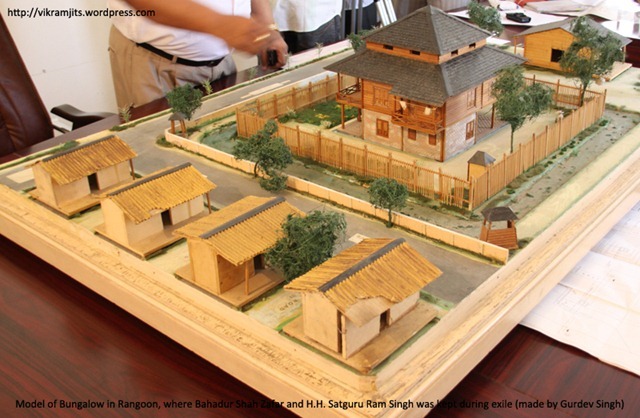 Once my father had this layout, he went on to research the architecture used in Burma/Rangoon those days. He was aware that the first floor of the building was of bricks and the upper part was traditional wooden structure in native architecture. Being an architect, my dad had no trouble getting the designs. 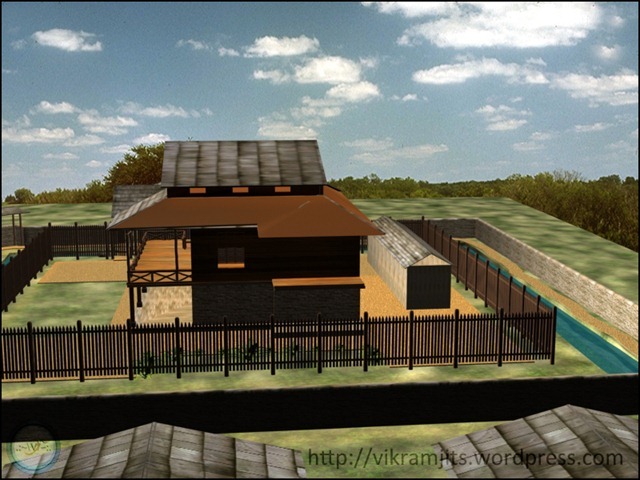 The result was this 3D model. 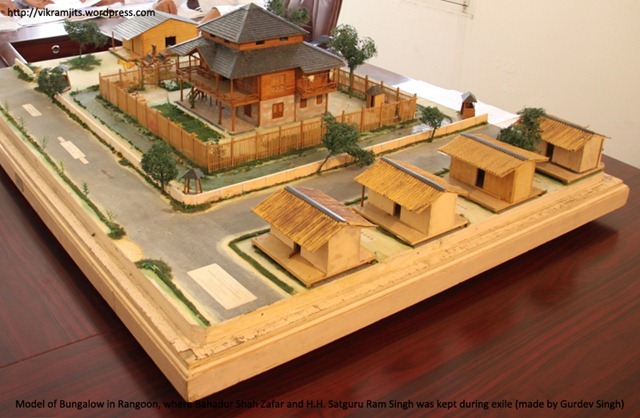 The above model was first kept at the reception of (Village) Gurudwara Sri Bhaini Sahib in district Ludhiana of Punjab, India. 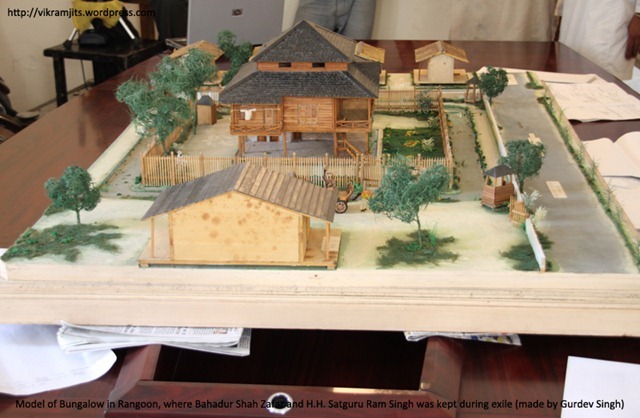 Later it was moved to the museum in ‘Ram Mandir’ in the same Village-Gurudwara. 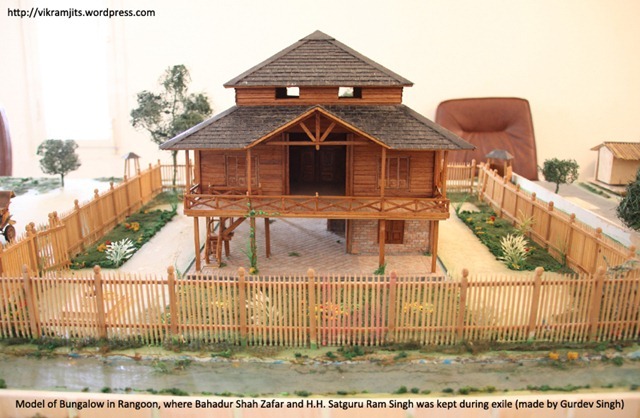 After this model, my father built the model of the original house that H.H.Sri Satguru Ram Singh ji built from where the Kuka Movement started. 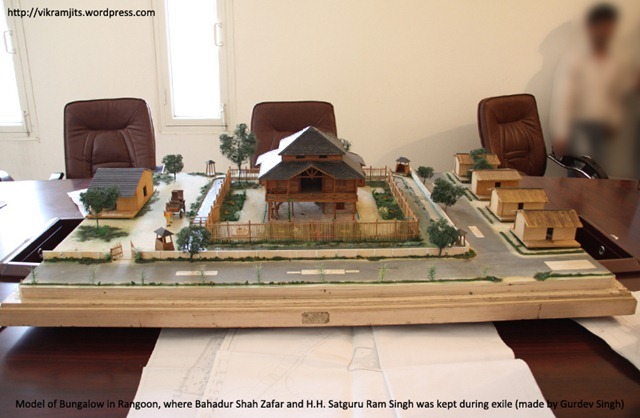 During this, he was also redesigning entire village, which is now converted to a huge Gurudwara and is the headquarters of the Kuka/Namdhari community. 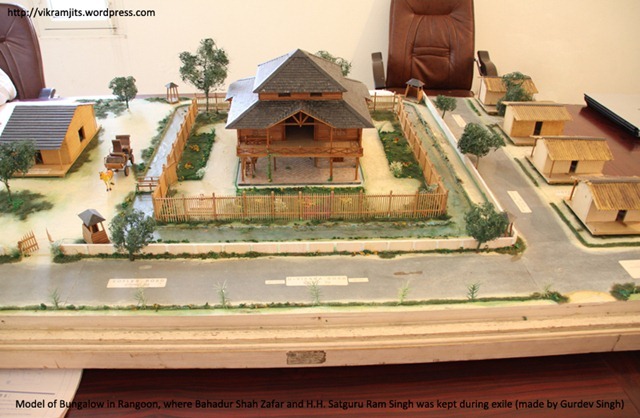 People loved this model so much that my father was asked to create a miniature park depicting the entire history of Kukas. This park was built in 2 years with several models of forts and palaces involved in the Kuka Movement built in 1:100 ration. I will write a post about them in coming days. 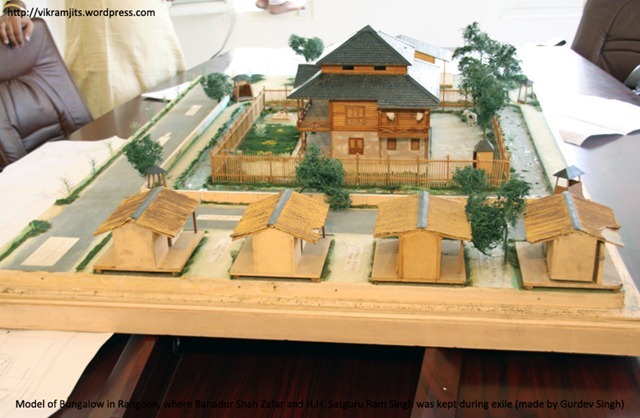 That park includes a much bigger model of this Bungalow. The bungalow was later converted to a Warrant Office (Military Post Office) and now a portion of its land is part of the local School. 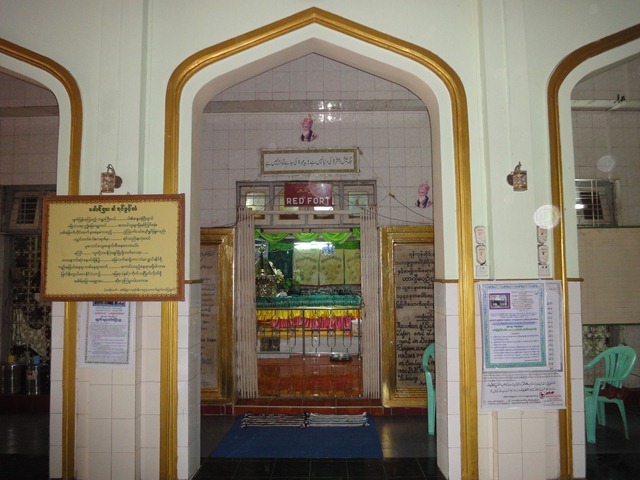 Locals created a small shrine on the remaining part of the property but on 16th February 1991 they found a grave some 25 feet away from that shrine while digging. “Three feet deep, the skeleton of the king was found intact”, reports William Dalrymple. That is when they realize that actual grave is in the garden behind. 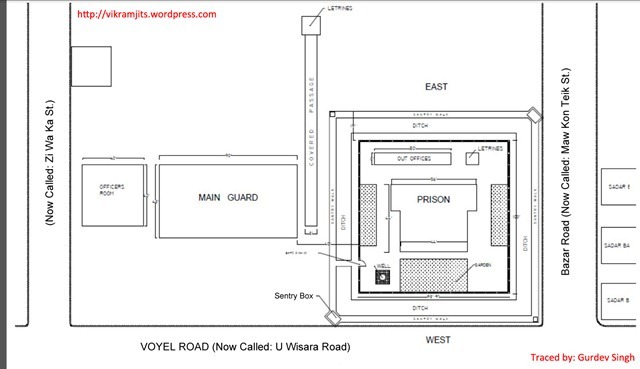 The new complex, now called the ‘Dargah of Bahadur Shah Zafar, Emperor of India’ opens to Zi Wa Ka Street connecting U Wisara Road (originally called Voyel Road) and Shwedagon Pagoda Road. 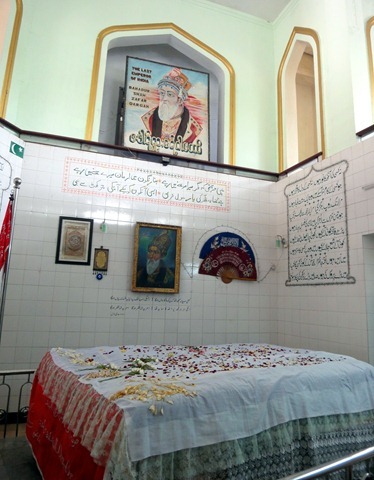 Bahadur Shah II (Zafar) wanted to be buried next to his father Akbar Shah II in Zafar Mahal (which was originally known as Lal Mahal or Rang Mahal) in Mehrauli. 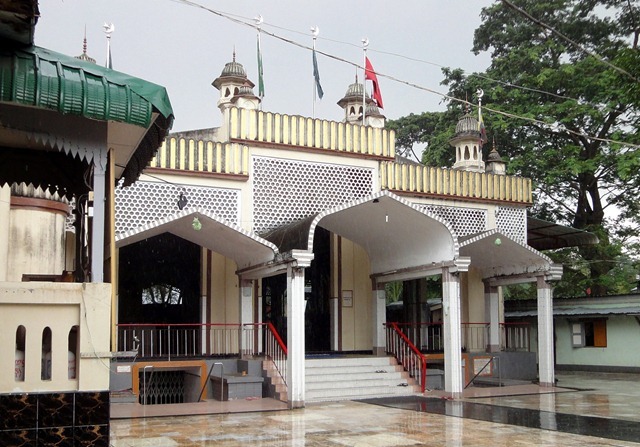 This building was constructed next to the Dargah shareef of Khwaja Qutbuddin Bakhtiyar Kaki (r.a.) when Akbar Shah II started the famous Sair-e-Anjuman-e-Gul-Faroshan (Phoolwalon ki sair). This place was used as the palace for the royal family, where they used to stay during the Urs of Khwaja, when the said festival was celebrated.